New York, NY – February 12, 2019 – Launched in 1919, Children’s Book Week, a national celebration of books for young people and the joy of reading, proudly announces its centennial celebration. 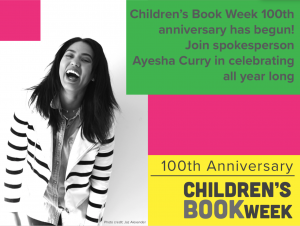 The longest-running literacy initiative in the United States, organized by Every Child a Reader, is kicking-off the celebration with Ayesha Curry, a New York Times bestselling author, television host, and mother of three, as its spokesperson and chair. Also revealed for the first time is the official 100th anniversary poster, illustrated by Yuyi Morales. Over 125,000 posters will be distributed during Children’s Book Week between April 29 and May 5 at over 1,000 participating schools, libraries, and bookstores in all 50 states. The 100th anniversary theme – “Read Now. Read Forever.” – looks to the past, present, and future of the fun and enriching experience that is children’s and young adult books. The poster art and downloadable resources are now up at Every Child a Reader. Additionally, Parents, the preeminent magazine for moms and dads, will be a media partner for the centennial celebration. Marketing partners include BookCon, First Book, Sesame Street, Screen Free Week, and other national organizations. “I’m proud to serve as the spokesperson and chair for the 100th year of Children’s Book Week. My family is at the heart of everything I do and one of the things that we all share is a love of reading,” Ayesha said. “I remember reading and being read to as a child and that experience has shaped my life. As a parent, I love watching my children get excited about reading. With a book in their hands, they can travel to make-believe lands or read about people who make a difference.” Ayesha is the bestselling author of The Seasoned Life Entrepreneur, host of Ayesha’s Home Kitchen on Food Network, and wife of NBA superstar Stephen Curry. Her list of must-read children’s books is posted now at Every Child a Reader. >> KidLit TV is sponsoring and producing 100 videos of authors and illustrators talking about their favorite characters. These three-to-five minute spots will be posted online at KidLit.tv beginning in late March and be available throughout 2019 and beyond. >> Voting will take place for the 12th annual Children’s & Teen Choice Book Awards, the only national book awards chosen solely by young readers. Kids and teens can “Voice Their Choice” online from March 1 through June 2. Teachers can also submit group ballots for an entire class online and print out “I Voted” stickers. >> Random House is publishing 100 Years of Children’s Book Week Posters, edited by Leonard Marcus,on March 5, featuring work from early luminaries such as N. C. Wyeth and Marcia Brown to contemporary illustrators such as David Wiesner, Mary GrandPré, Christian Robinson, and Jillian Tamaki. >> Nineteen acclaimed illustrators are producing collaborative yearlong anniversary poster panels, to be released a month at a time, and six original bookmarks. Also available online at Every Child a Reader’s website will be event kits, activity pages in a dozen languages, a poetry bookmark, and much more. Locations and details for over 2,500 events being held during Children’s Book Week (April 29 – May 5) will be listed on an online map at EveryChildaReader.net in early April. >> The Rabbit Hole, the world’s first “Explor-a-Storium,” will feature a three-dimensional portal through which kids and teens can experience the history of Children’s Book Week and classic children’s books. This Kansas City museum is due to open this fall. Every Child a Reader is a 501(c)(3) literacy charity dedicated to inspiring a lifelong love of reading in children and teens. Every Child a Reader’s national programs include Children’s Book Week, the Children’s & Teen Choice Book Awards, Get Caught Reading, and the National Ambassador for Young People’s Literature program (in conjunction with the Library of Congress).Every Child a Reader is managed by the Children’s Book Council, the nonprofit trade association for children’s book publishers in North America, partnering with national organizations on reading lists, educational programming, and diversity initiatives.